The Granada City Tour tourist trains are unique in Europe and designed expressly for the city of Granada. Our trains, which move at a top speed of 25 kph, have a hybrid electric engine that reduces gas emissions by 40% compared to conventional trains. They can hold 54 passengers and have a space designed for persons with reduced mobility. The trains have a see-through roof in every car to make it easy for all the passengers to look outside. There are also TFT displays with information about the city and on all the excursions you can book from the Granada City Tour office. You can also find informative brochures onboard. The train features an individual audio guide in 12 languages (Spanish, English, French, German, Italian, Portuguese, Chinese, Japanese, Korean, Russian, Arabic and Catalan), along with two special channels for children in Spanish and English. The Granada City Tour tourist trains also have free Wi-Fi so you can go online while riding with us. All the cars have heating. All our trainsfeature a free Wi-Fi Internet connection, allowing you to go online as you travel with us. Panoramic roofs in all the carriages provide enhanced traveller sightseeing enjoyment. Multilingual individual audio guide: Spanish, English, French, German, Italian, Portuguese, Chinese, Japanese, Korean, Russian, Arabic and Catalan. It also features two special channels, in Spanish and English, for kids. TFT screens offer information about the city and the different excursions available from our Granada City Tour office. 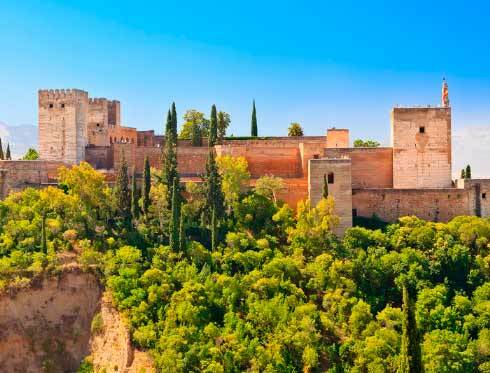 Granada City Tour is the best way of getting to know the city’s most fascinating sights. We have designed two different routes, both of which will take you to Granada’s most important locations: the Alhambra Route - Daytime and the City Centre Route - Nighttime. You can do the tour in a single trip, or enjoy our hop on - hop off option, which allows you to get on and off as often as you like at any of our stops, all of which are located at important points of interest. Using our audio system, provided in 12 languages (Spanish, English, French, German, Italian, Portuguese, Chinese, Korean, Japanese, Russian, Arabic and Catalan), you can choose your language and follow the audio comfortably throughout our tour. It also features two special channels, in Spanish or English, for kids. Thank you in advance for choosing Granada City Tour. Together, let’s enjoy this different, convenient way of discovering Granada! 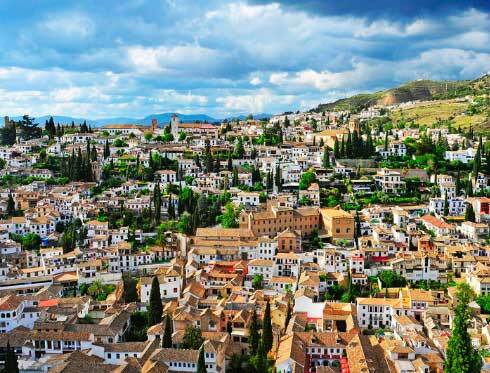 Create your own itinerary to see Granada. 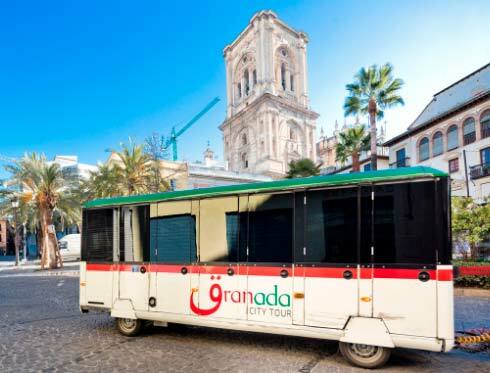 The Granada City Tour Hop-on Hop-off service offers you endless possibilities to create your own itinerary to see Granada. With our Hop-on Hop-off service you'll be able to get on and off the train as often as you want for as long as your ticket is valid so you can discover the city's most important spots. 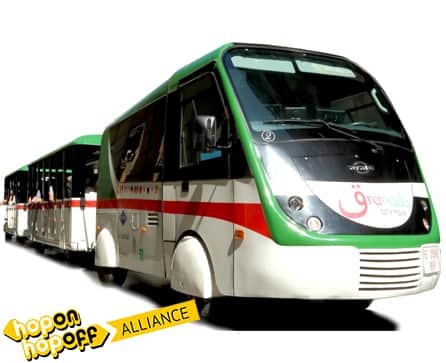 The Granada City Tour train will take you to all of the city's tourist attractions, and with our Hop-on Hop-off service you can create your own tailor-made itinerary. Get off the tourist train and get on again at any of the stops along the route. Check our stops on our tour route map or on our mobile app. Multilingual individual audio guide georeferenced: Spanish, English, French, German, Italian, Portuguese, Chinese, Japanese, Korean, Russian, Arabic and Catalan. It also features two special channels, in Spanish or English, for kids. -Alhambra Route - Nighttime: 7:30pm to 11:00pm. Frequency 60’. Friday & Saturday. 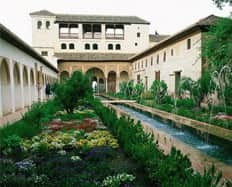 - Alhambra Route - Daytime: 9:30am to 9:30pm. Frequency 16’ - 20’. Everyday. -Alhambra Route - Nighttime: 8:30pm to 11:00pm. Frequency 30’. Everyday. Service's starting and ending time (not last departure).